In the last four years of California’s drought, more than 12 million trees have died from lack of water. The lack of rain and the year-round heat continue to kill trees in our state’s national parks, tree-lined streets, neighborhoods and our own yards. 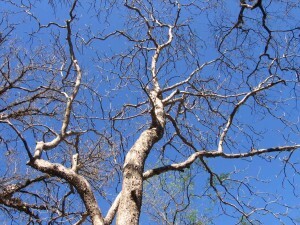 During times of drought, it is especially important to monitor your trees. Below are several signs that your trees may be drought-stricken and solutions to protect these beautiful and valuable natural assets. 1. Adhere to all water regulations and rules. Know the water regulations in your community and/or water district. These restrictions are in place for a reason and failure to comply may carry costly fines. 2. Water Wisely. Do not excessively water during a drought. Find out the proper amount of water your landscape and trees need to survive and water accordingly. Depending on the tree species, water with 5 to 20 gallons, once or twice per week. 3. Inspect Irrigation Systems to ensure water is not leaking or being wasted. 4. Time it Right. Water your trees between 6pm and 10am. Watering during these hours prevents evaporation and maximizes the amount of water reaching your tree’s roots. 5. Avoid watering the trunks or stems of your trees and plants. Watering these areas can case tree cankers or root-rot disease. Water the roots and they will feed the rest of the tree. 6. Water newer trees first. Newly planted trees need more water than mature trees. 7. Postpone planting. To conserve natural resources during a drought, delay any plans to plant new trees and plants in your landscape. When drought conditions improve, reassess your landscape plans and plant additional trees and plants at this time. 8. Apply Mulch. Mulch is beneficial for preserving moisture in your tree’s roots and mitigates water evaporation. Mulching can also combat infestation and disease. 9. Collect and re-use excess water. Use buckets indoors to collect water from leaky faucets or excess shower water. This water can be re-used for your trees and plants. 10. Drought-proof your landscaping. Knowing that Southern California is drought-prone, research and invest in plants and trees that require little water. This will help lower your water bill and ensure your trees and landscape stay alive and beautiful much longer. Concerned that your trees and plants are suffering during this drought? Schedule a free consultation to determine what action may need to be taken to save your trees and landscaping.